Four properties along the scenic Lower Susquehanna River comprise the Susquehannock State Park Complex. The 224-acre Susquehannock State Park is on a wooded plateau overlooking the Susquehanna River in southern Lancaster County. Besides the outstanding view, the park offers a variety of recreational opportunities for year-round fun. From Lancaster and PA 372, turn left on Susquehannock Drive then right onto Park Road. From York and PA 372, turn right on River Road, right on Furniss Road, hard right on Susquehannock Road, and right onto Park Road. From Lancaster and PA 324, turn left onto River Road. After about 5 miles, turn right onto Pinnacle Road. From York and PA 372, turn left on River Road and then left onto Pinnacle Road. Urey Overlook is along PA 425 between Kline Road and Otter Creek Campground. Panoramic views of the Susquehanna River can be seen from the 380 feet high overlooks of the park complex. When enjoying the views, visitors should remain a safe distance back from drop-off areas and children should be closely supervised. Hawk Point Overlook offers visitors a glimpse of the Conowingo Reservoir, the northernmost and largest of several hydroelectric impoundments on the lower Susquehanna River. Straddling the Pennsylvania and Maryland border, the reservoir generates hydroelectric power and cooling water for the Peach Bottom nuclear reactors while also serving as a popular boating and fishing destination. Located downriver on the far left of Hawk Point, visitors can see Mount Johnson Island, the world’s first bald eagle sanctuary. For many years, Mount Johnson Island hosted a pair of nesting bald eagles. Visitors can use the optical viewer or binoculars to spot eagles, osprey, turkey vultures, and black vultures that regularly soar by these cliffs using columns of rising air called thermals. 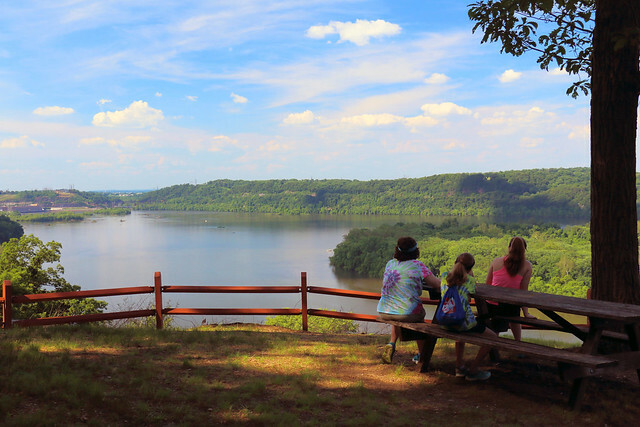 Pinnacle Overlook offers beautiful views of the Susquehanna River’s Lake Aldred. The overlook is a good place to access the Kellys Run Trail System of the Lancaster County Conservancy and the Conestoga Trail System maintained by the Lancaster Hiking Club. Upstream of Susquehannock on the west side of the river is Urey [your-ee] Overlook, which provides spectacular views of the river, Weise Island, and the Safe Harbor Dam. Urey Overlook is on the 193-mile Mason-Dixon Trail, a blue-blazed foot path which connects the Appalachian Trail to the Brandywine Trail. Wisslers Run Overlook gives an excellent view of the Susquehanna’s naturally rocky riverbed. The overlook also provides a view of the Muddy Run pump storage hydroelectric plant with the impressive 21-span Norman Wood Bridge and Holtwood Dam in the background. The osprey nest on the large power line towers in front of the overlook. This activity or structure is ADA accessible. Ballfield and Hawk Point pavilions, upper and lower restrooms, Hawk Point Overlook, and the park office are fully ADA accessible.